Win your own garden BioBlitz! Alongside the 2018 Great Wildlife Expedition (at Hengistbury Head on June 9th), Hengistbury Head are offering you the chance to have a BioBlitz in your own garden! 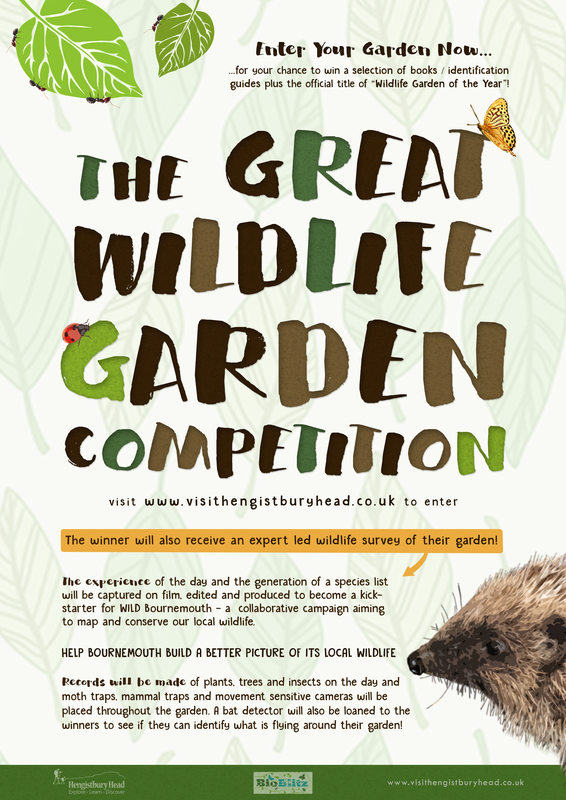 The winner of our Great Wildlife Garden Competition will have a team of experts take over their outdoor space on June 16th. Using detectors, hand lenses and lots of books, the team will identify bats, mammals, moths, birds and plants that live in, or visit your garden. You will be able to spend time with the team and learn the difference between the species that thrive on the work you have done to make your garden a place for nature. The team will show you where to go to record your finds, adding these species to Bournemouth’s wildlife map. There will also be a talented local film maker who will capture the day, the activities and the excitement of identifying the plants and creatures that live in your garden. Terms and conditions apply – see poster for details.